Click here for print version of translation. Charles Kurzman, “The Heresy of the Hijackers,” IslamiCommentary, September 11, 2011. What sort of Muslims carried out the largest mass murder in American history, 12 years today? 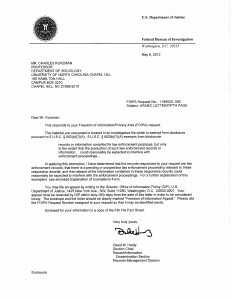 The FBI refuses to release a document that might show just how unusual their brand of Islam was, and further reduce what little sympathy they enjoy among the world’s billion Muslims. 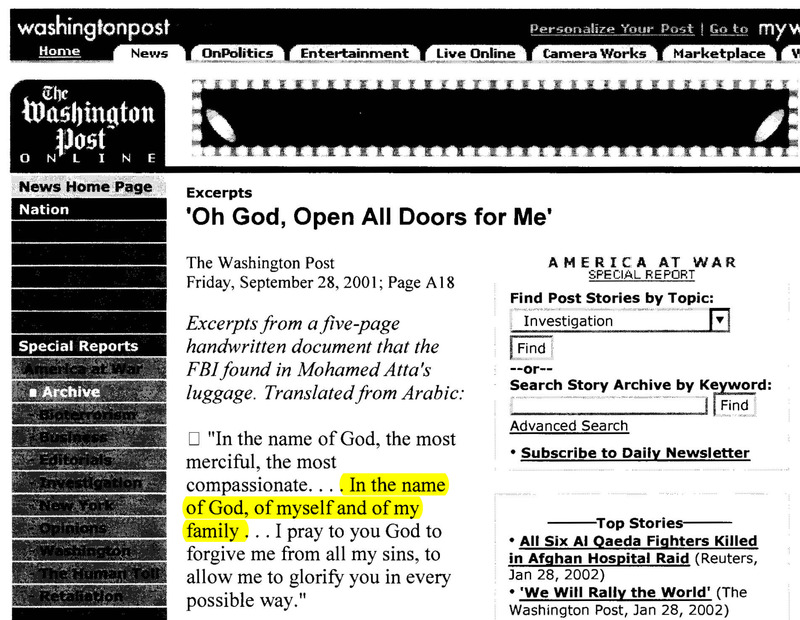 This document, a handwritten note by 9/11 organizer Muhammad Atta, opened with a heretical-sounding invocation — “In the name of God, and of myself, and of my family” — in addition to the standard invocation, “In the name of God, the compassionate, the merciful.” We know this from a government translation that was leaked to the Washington Post (left) in late September 2001. In the court of public opinion, however, the document deserves close inspection. To associate oneself and one’s family with God, as Atta’s invocation (“In the name of God, and of myself, and of my family”) seems to do, is considered impious by virtually all Muslims — a breach of the monotheism that is central to their faith. 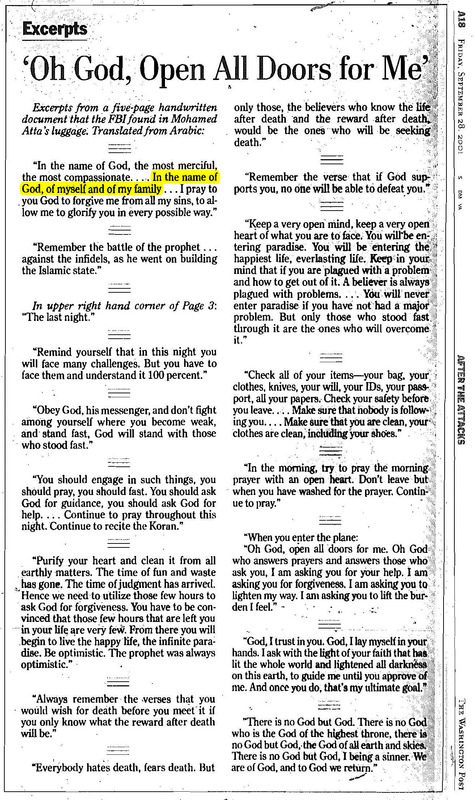 “Whoever associates others with God has committed a terrible sin,” the Qur’an declares. If the leaked translation of Atta’s invocation is correct, and the document is genuine, then the release of the missing page might help accentuate the sharp theological divide between puritanical Wahhabis and al-Qa’ida militants. Likewise, Atta’s odd invocation could provide further grounds for Muslim religious scholars of all stripes to distance themselves from the terrorists. Almost every major Muslim leader in the world denounced the attacks of 9/11, publicly and forcefully. Even Islamic militants — 46 leaders of radical movements in Pakistan, Egypt, the Palestinian Authority, and elsewhere — released a joint proclamation on September 12, 2001, expressing sorrow for the “innocent lives” lost on the previous day: “We condemn, in the strongest terms, the incidents, which are against all human and Islamic norms.” They quoted a verse of the Qur’an on the inviolability of innocents: “No bearer of burdens can bear the burden of another.” (This and dozens of other Islamic statements against terrorism are available on my website. Of course, ordinary Muslims too were horrified by the violence perpetrated in their name. While television cameras zoomed in on small crowds cheering the news, far greater numbers gathered in sympathy with the victims of September 11, carrying candles and flowers. Rumors blaming the U.S. or Israeli government spread among Muslims who were so appalled by the event that they did not want to believe fellow Muslims could be responsible. 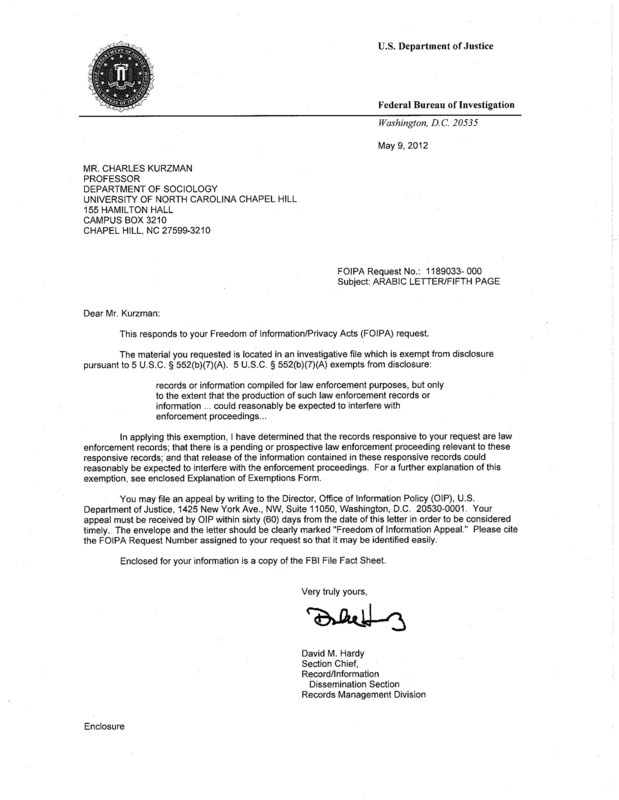 Many of these people will not be swayed by the release of a document that they may not consider genuine. But for the small cohort of Muslim revolutionaries who embraced the “raid” on America, as they called it, the missing page of the hijacker’s letter could well be cause for consternation — further calling into question the theological purity of the attack and of al-Qa’ida itself.